The ID David automatic in-row weeder is adjustable to you and your vineyards needs and can be attached to the tractor in various way, including on the right side between the wheels, on a front 3-point hitch, or on the back. It has a working speed of 5 MPH and has excellent performance in many types of soil. The weeder is hydraulic powered by means of the tractor circuit or through an independent hydraulic plant. Operating principle: The electrohydraulic arm developed for the cultivation and destruction of grass and weeds around plants with a minimum diameter of .5" has an electronic sensing device that detects the plants. When a plant has been detected, the arm makes an indispensable movement to avoid collision and thus damage to the plant. Various models and attachments are available to best fit your specific needs. Call us today for more information or to schedule a demo! 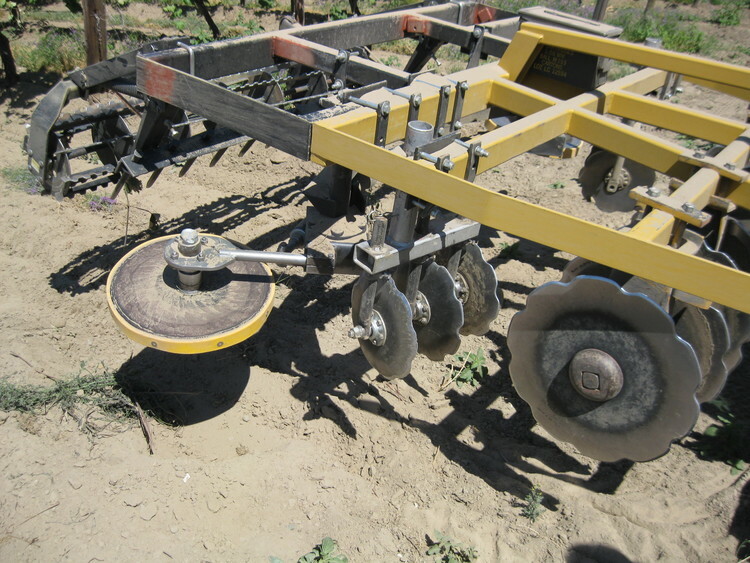 The Tournesol comprises a hinged arm (equipped with dampers which ensure the stability of the assembly); a skid which pre-positions the working tool and a flexible shroud (comprising 2 retractable identical and hinged blades), which roll around the vine or the tree trunk. Thanks to the protective hat there is no risk of damaging the vines: You protect the soil, your vegetation, as well as your vine or orchard. The Tournesol allows an unrivaled quality of unequal work that keep the soil flat after passing the vines. One can work throughout the year (while avoiding the work throughout the year (while avoiding the problem of flower inversion). The work varies from 2 to 3 km per hour depending on the type and condition of the soil. Vine Tech Equipment still provides service and parts for the Turnesol! The Edwards Brush Spider is designed for sweeping prunings, leaves and debris from the tree row. The unit combines with weed sprayers, shredders and tillage tools for efficient single pass clean up operation. The brush spider can be mounted to the corner of an offset mower, bucket loader or the three point of the tractor. This berm sweeper for orchard, vineyards, berries, and nurseries. 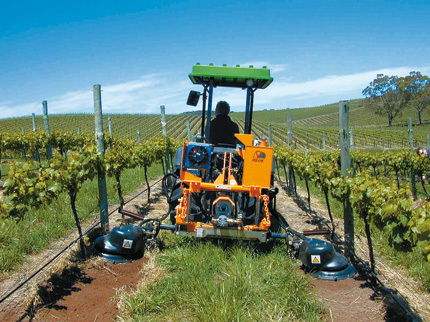 The Edwards Brush Spider enables you to clean around posts and between vines in vineyards without extra trips or hand raking. The Brush Spider sweeps prunings, leaves and other debris away from rows and into the path of your mower, shredder or tiller. The durable polyurethane sweeping finger provide long life with action that is gentle on vines and posts. The Edwards Brush Spider will sweep the berms clean of prunings, leaves and debris.